So this was the piece I made for the show that Idle Hand, the tattoo shop I get my work done at by Holly Ellis, is putting on for their 5th anniversary. As far as I know, it’s still there? I have no idea when it’s over, but the opening party happened while we were out of the country. If you live in SF, you should go check it out! It was super fun to make, and now I want to make a spaghettios cowl! Or maybe Froot Loops! Also cheese puffs and/or cheese balls! Etc etc ETC!!!!! Here is also a silly video to see it in motion, if you haven’t already seen this on Flickr. 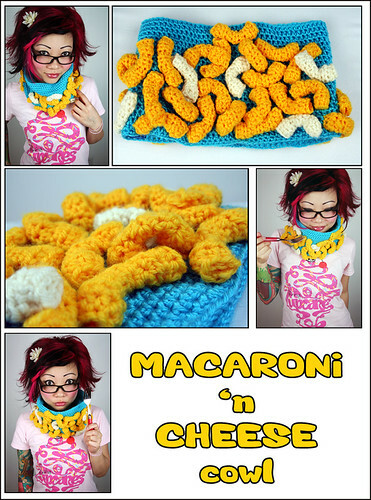 I made it just to show you how there are varying amounts of macaroni on the cowl, for your every mood! One Response to Mac-N-Cheese cowl Photos! so cute and random :). Looks great.